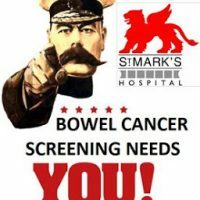 Help us promote Bowel Cancer Screening & St Mark’s Projects! St Mark’s Hospital Bowel Cancer Screening Centre’s Health Promotion Team have been working with organisations across Ealing to increase uptake of Bowel Cancer Screening across the borough. In the past month they’ve worked with those with Mental health & Learning Disabilities, the Visually Impaired (Ealing Association for the Blind), the Irish Pensioner’s Forum, volunteer forums and more. By working with local community groups, they’re able to promote awareness of Bowel Cancer and the Screening options available. The goal is to help prevent cancer by promoting uptake of screening tests. Do you know any local organisations, community groups or associations who’d benefit from a talk about prevention of Bowel Cancer? Or about the various research & education different projects taking place at St Mark’s Hospital? By talking about the work St Mark’s is doing, you can help raise even more funds for research and education. Contact info@stmarkshospitalfoundation.org.uk or call 020 82354092 to tell us how you can help. The NHS Bowel Cancer screening programme covers Bowel Cancer screening in Ealing. Available for those registered with a GP and aged 55-59 through a one-off Bowelscope test (by invitation) at St Mark’s Hospital. Or for those aged 60-74 through an easy-to-use postal testing kit which is sent every two years.